A roof is a vital part of a house. There are different types of roofing you can choose from for your roof to give it an elegant appearance. Metal roofing is in high demand, but some homeowners are doubtful about it due to some common misconceptions of metal roofing. As the leading roof repair in Houston, we have a list of four misconceptions about metal roofing. One of the most common misconceptions connected to metal roofing is that it makes noise when it rains. A metal roof is not any more or less noisy when compared to an asphalt shingle roof. Metal roofs contain a hard exterior which acts a buffer for sound. Another misconception that people have about metal roofing is that it is not aesthetically pleasing. Nowadays technology advancements have led to the making of metal roofing in various styles to fit the consumers needs and vision. Furthermore, metal roofs are available in a full array of color varieties. You can select a metal roof to suit the style of your home whether it be modern or traditional. It is highly recommended to hire top-rated roofers in Houston Texas for quality metal roof installation. Though it may be possible that a metal roof includes a higher upfront cost, that cost is offset with a high lifespan in comparison to their asphalt shingle counterpart. Because of higher durability, it involves less maintenance. In general, metal roofs design that can last up to 50 years, which is about twice the lifespan of an asphalt shingle roof a similar aesthetic. As mentioned above, the misconception that metal roofs don’t last long is completely false. Metal roofing’s design enables resisting harsh climatic conditions like heavy rainfall, heavy winds, wildfires, etc. The fact is that metal roofing is meant to last for 50 years with fewer maintenance needs and thereby is actually more cost-effective. As the leading roofing contractors in Houston TX, we have an expert team of roof experts having vast experience in inspecting, installing and fixing metal roofs. So the myths as mentioned above, are not accurate and have been debunked above. If you are looking forward to giving a beautiful look to your home by choosing a metal roof, feel free to contact us, and our professionals will assist you further. 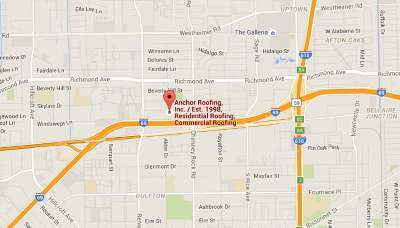 At Anchor Roofing, we have rich experience to fix different roofing problems.